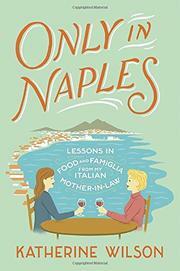 An American woman falls in love with an Italian man, his ebullient family, and a vibrant city. In her warmhearted debut memoir, Wilson recounts arriving in Naples in 1996, just graduated from college, to embark on a three-month internship at the U.S. Consulate. Naples, “dirty and dangerous,” seemed to her tony friends and family an odd choice, but for the author, it amounted to a bit of rebellion. “I spent my childhood overachieving,” she writes. “It was time for a change.” Through the consul, who was a family friend, she met Raffaella Avallone, a glamorous 56-year-old who traveled in the best Neapolitan circles. Raffaella set her up on a date with her son, Salvatore, a handsome 23-year-old with an “adorable laugh,” and Wilson was smitten—not only with Salva, but also with his entire welcoming, embracing family and a culture that exalted the art of dining. Once a self-confessed binge eater, the author discovered a new relationship to food. “In Neapolitan culture,” she writes, “mealtimes are sacred—food is freshly prepared and consumed in campagnia. There is no rushing.” In the Avallones’ kitchen, Wilson watched as Raffaella prepared the delectable dishes that her family loved, such as eggplant parmigiana, ragu, and octopus salad, for which Wilson includes recipes. Enraptured with Naples, the author was surprised when Salva, visiting her in the U.S., became “enthralled by…a consumer culture that was much more advanced than that of Italy.” He quickly learned that phrases like “reward points, preferred customer, and supersaver” could lead to bargains. Wilson managed to live in Italy for several years, enrolling in a graduate program in international studies, teaching English, and pursuing her dream of acting—all while waiting for Salva to propose. But their big wedding in Washington, D.C., perplexed the Avallone family: there was no pasta. An exuberant account of love and great Italian food.